Several key steps need to be undertaken for optimal derivation/calculation of regional and global deformation. I would like to redirect the reader to earlier published work by our group (open access paper, click link) where we describe our applied methods for the optimal image acquisition. 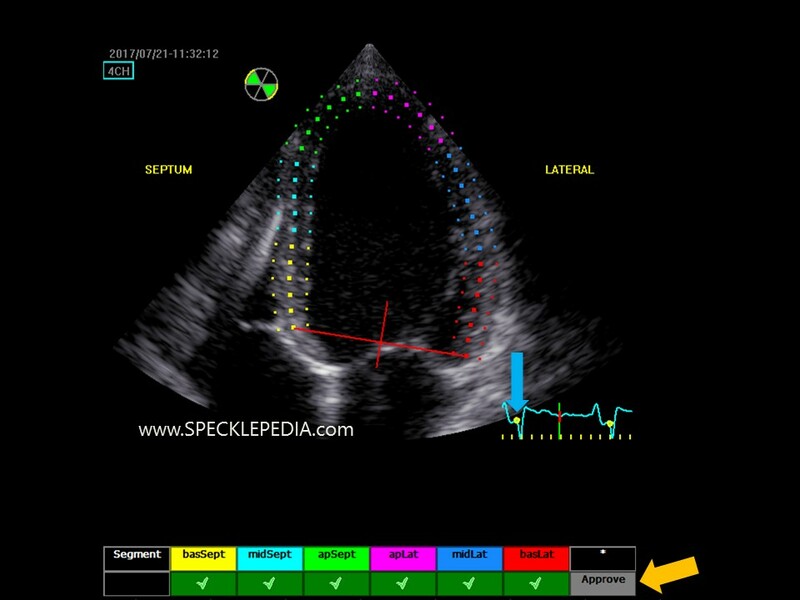 This manuscript also guides the reader through the different steps of post possessing the echocardiographic images. 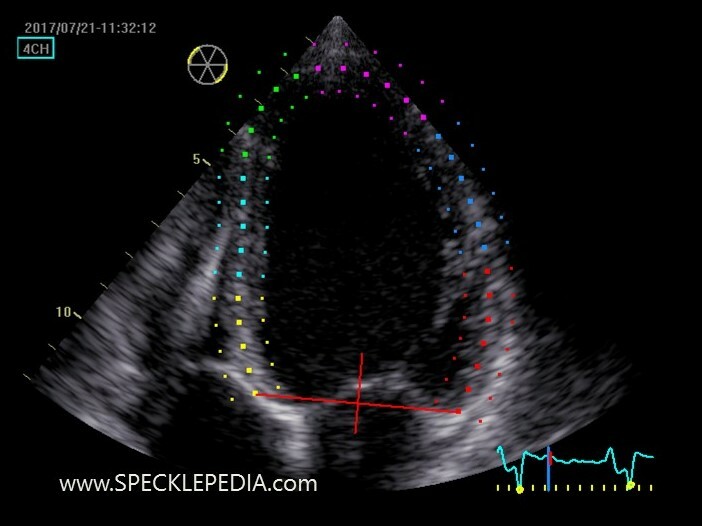 The most important requirement of deformation imaging, as with all echocardiographic measurements, is adequate image quality. With poor image quality, the tracking algorithm of the software has less data available (and/or more noise) for tracking. This will result in unreliable derivation of the abovementioned parameters. – Determine what deformation parameters are required. Are you aiming to calculate the global longitudinal strain, interested in regional deformation values, or investigating specific timing intervals? Aim to optimize image settings (sector width, sector depth, frame rate, etc) in order to achieve the optimal temporal and/or spatial resolution mandatory for the question to be addressed. – Make sure the ECG registration is optimal. Aim at a minimum or no noise on the ECG recording and a clear appreciation of the P-wave, QRS complex and the T-wave. Timing of the starting point of strain and the aortic valve closure time are aligned on the ECG. – Adjust the image sector (see above) in order to have the LV segments in the image sector. Avoid a very broad image sector, since this reduces temporal (and often spatial) resolution. Also adjust the depth since the atria are not necessary in this view, but make sure the annular plane remains in the field of view throughout the entire cycle. – Optimize the 2D image. 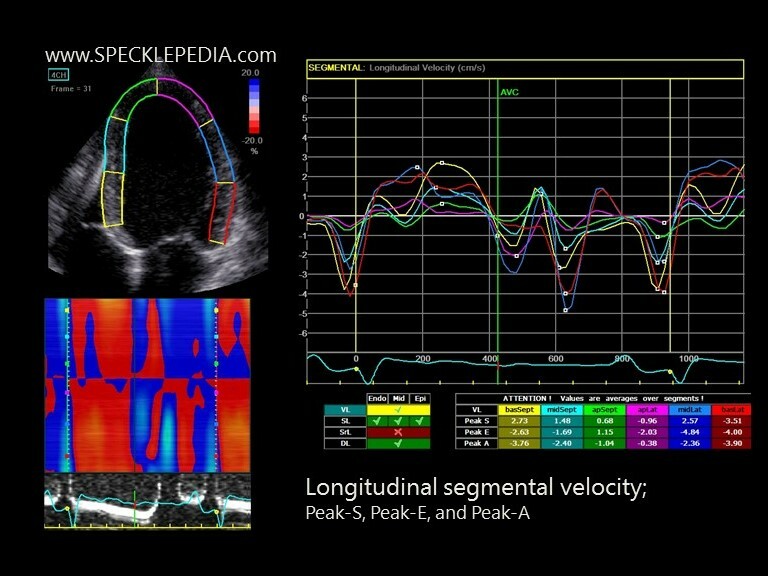 All LV segments and their endocardial borders should be clearly seen throughout the entire cardiac cycle. Avoid fore-shortening in the apex. 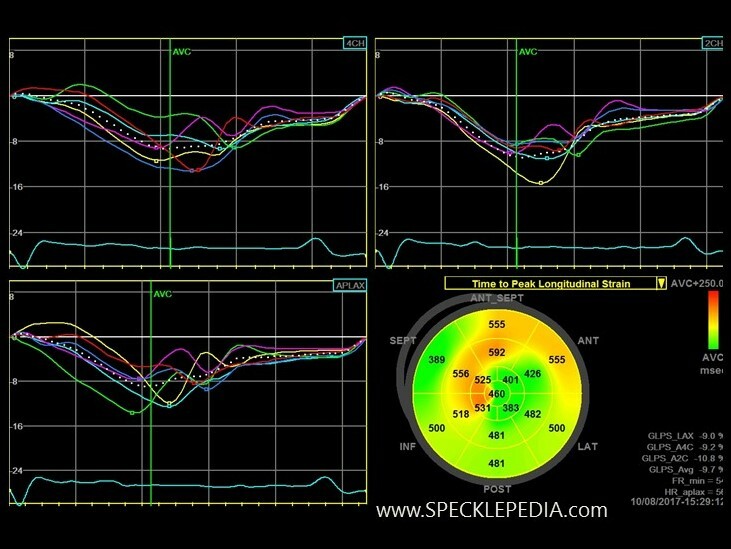 The through plane motion severely disturbs the calculated strain and strain-rate values, significantly overestimating regional apical strain and strain-rate. 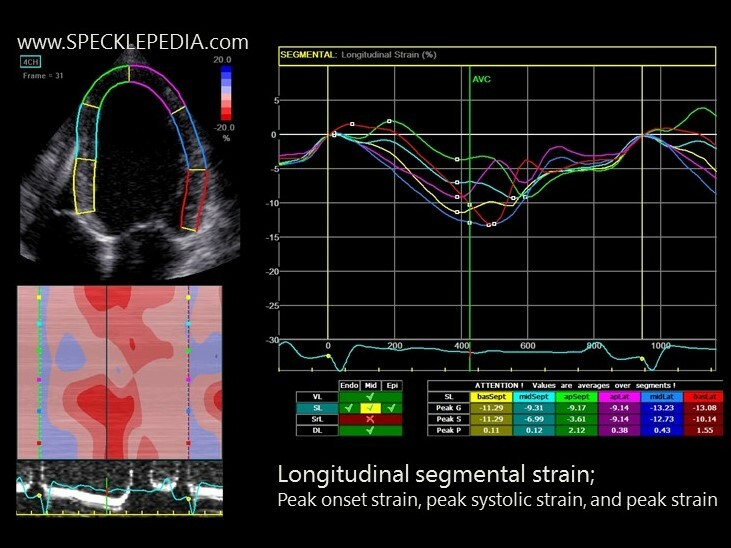 This also holds true for the through plane motion of the mitral valve annulus during systole in the short axis view. Aim to avoid specific artefacts that hinder in the post-processing. These include drop-out, reverberations, and side lobes. Acquire the 2D image during breath hold. This not only helps in optimizing the image, but also in reducing the respiratory motion of the heart through the image (and image plane). A. 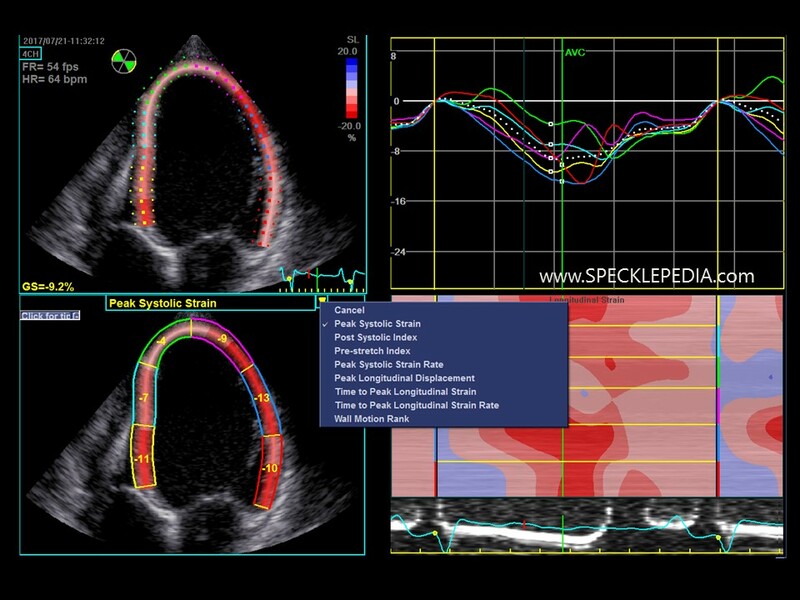 First of all, choose the best image available of the entire echocardiographic examination for the offline analysis and go to the software package available for 2d strain analysis. Using high quality images for the post processing is preferable, although moderate quality images are often still suitable for offline analysis. Take note: in our institution we use the EchoPAC workpack for our offline analysis. The provided images are therefore taken from this. The appearance of the graphs and software possibilities differs between vendors. Nevertheless, the basic principles of offline analysis are identical and largely interchangeable between these vendors. B. Name the specific view which is being used for offline analysis (i.e. 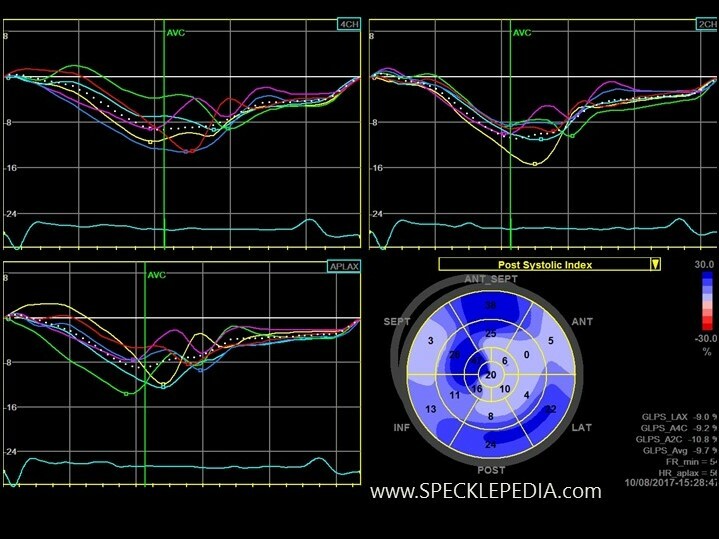 level of short axis view or the specific apical view), the software package will automatically request for this. C. Trace the endocardial border in a still frame. This still frame is automatically chosen by the software package (typically at end systole). 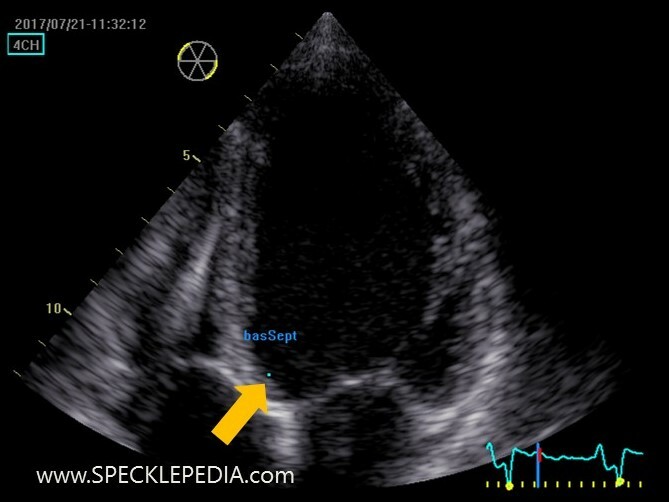 For those who are accustomed to trace the LV for an LVEF analysis, it is important to realize that the endocardial border should be traced for this analysis (while often the trace for the LVEF will be more mid-ventricular). Trace the entire endocardium from base towards the apex and back to the contralateral base in the apical views or trace the entire circumference in the shot axis views (excluding the papillary muscles). 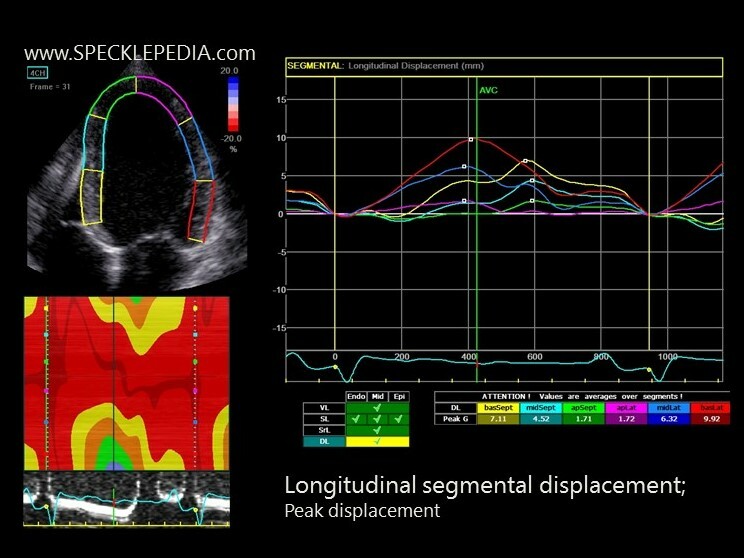 D. Set the region of interest (ROI) thickness to match the thickness of the left ventricular myocardium. Aim to include the entire thickness within the ROI while excluding the pericardium. 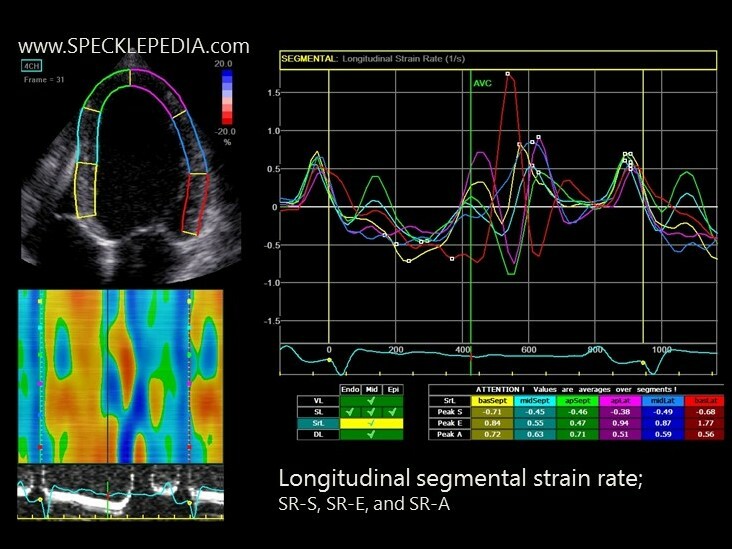 The pericardium has strong reflectors which do not show any deformation and could significantly impact the 2D strain analysis when included in the ROI. 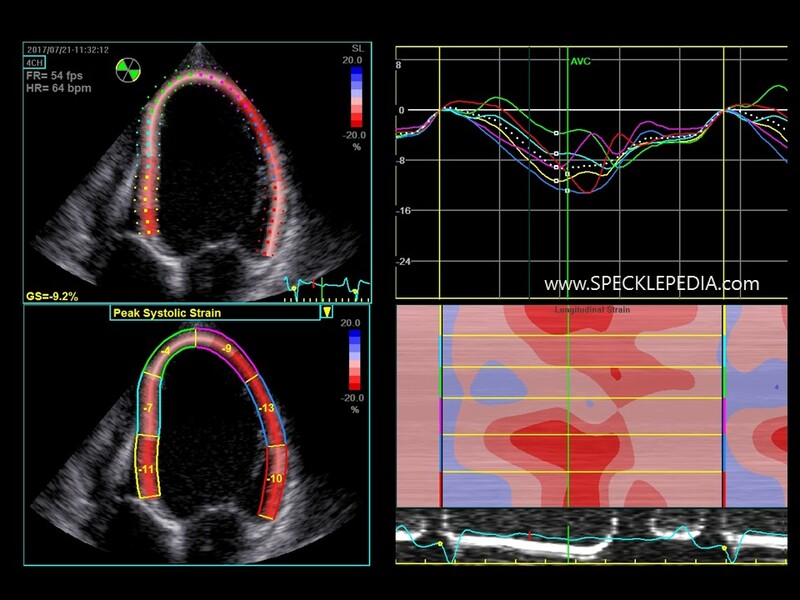 In particular the posterior basal wall in the apical 3-chamber view often disturbs post processing analysis. Several software packages have the feature to adjust the ROI thickness at a local level, which I encourage to use in order to optimize the ROI in the apex and/or regions with wall thinning (scar) or thickening (local hypertrophy). Of note: several 2D-strain software programs only acquire the endocardial border to be traced (such as TomTec). E. Initiate the sequence analysis. This means that the software program will fit the ROI in all frames within the RR-interval. This is done by identifying the specific “fingerprint” of acoustic backscatters within the ROI and identifying these through the temporal space, tracking its movement in the special direction. This is typically referred to as “tracking”. The precise background of this technique is discussed elsewhere (see online available teaching websites discussed above). Check the tracking quality visually. Often, an automated tracking score is provided which classifies the tracking as “appropriate” or “inappropriate”. However, this is often not fool proof and requires visual confirmation. If the tracking is inappropriate, adjust the ROI in order to optimize tracking. Visual assessment of the running image with the ROI overlay. 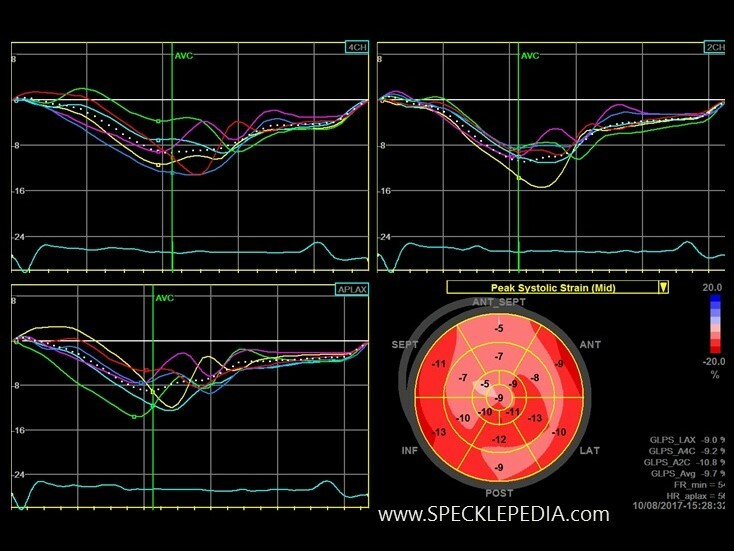 Check if the ROI follows the myocardial motion throughout the entire cardiac cycle. By reducing the loop-speed by 50%, a more reliable interpretation during rapid phases (diastole) is possible. 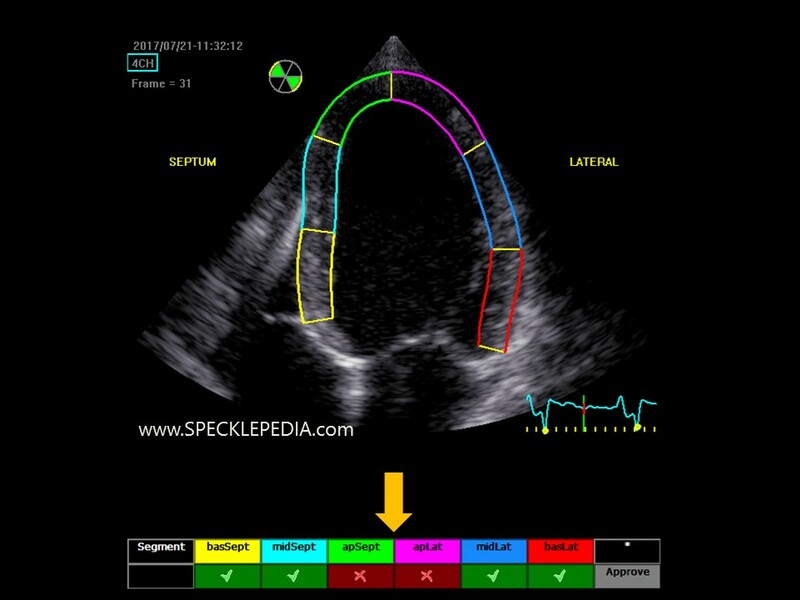 It is often easy to start checking this tracking in the basal segment at the mitral valve annulus level (in other words, the beginning and the end of the ROI). 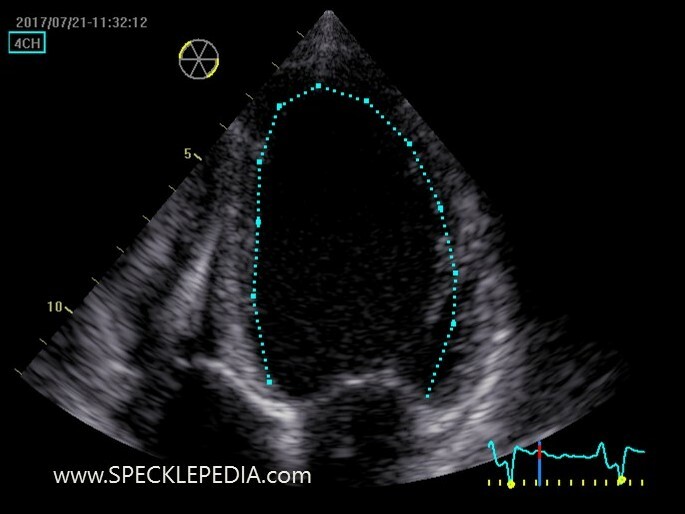 If the movement of these endpoints of the ROI do not move synchronous with the mitral valve annulus throughout the entire cardiac cycle, the tracking is inappropriate and should be adjusted. After checking the ROI at the mitral valve level, subsequently check the tracking at the other segments. Unmask inappropriate tracking by automated correction. Most software packages implement “drift-compensation”, which pulls the deformation graph toward the 0% line at the beginning of the next QRS complex. This masks any inappropriate tracking. By deactivating this feature, an additional check is performed. Some drift can be accepted. No specific advice can be provided on the amount of drift that is acceptable, this is left to the discretion of the person analyzing the graphs. the deformation patterns between adjacent LV/RV segments should show some coordination and coherency. In other words, abnormal deformation due to pathology shows some sort of transit towards the normal deformation in an adjacent segment, abnormal deformation graphs induced by artefacts often show a typical abrupt change towards normal deformation in an adjacent segment. Mark the end of systole, which is the moment the aortic valve closes. This can be determined via several methods. 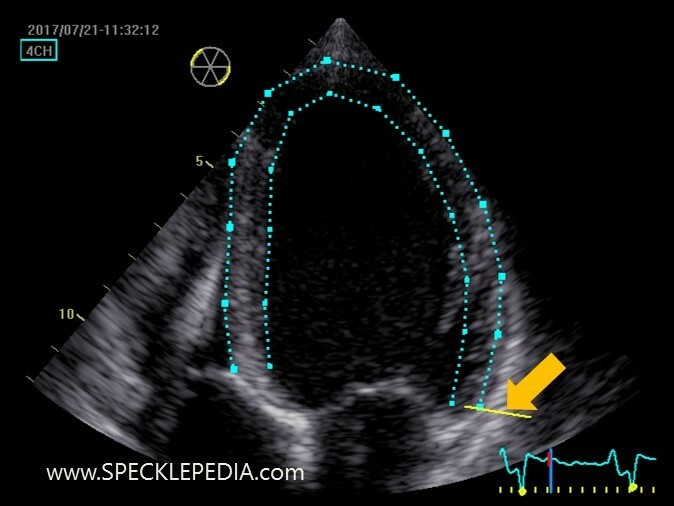 Typically I use a visual assessment of the aortic valve closure in the APLAX view and/or on the pulsed wave recording in the LVOT. There are several options to adjust the amount of special and temporal smoothing. I leave it to the discretion of the reader to adjust this. I typically leave these settings at “default”. I do encourage to experiment with these settings in order to get a better feeling and understanding on the amount of artificial smoothing applied by these different software packages. After all of the above, you are abe to evaluate the defromation(rate) graphs and values. There a several ways to evaluate this output. Some of the most common are shown below with an explanation on what is seen. Again, I would like to emphasize that the amount of data could be a bit overwhelming in the beginning. The figure above shows the so called “quad view”. This graphical representation is avaialble in basically all vendors.